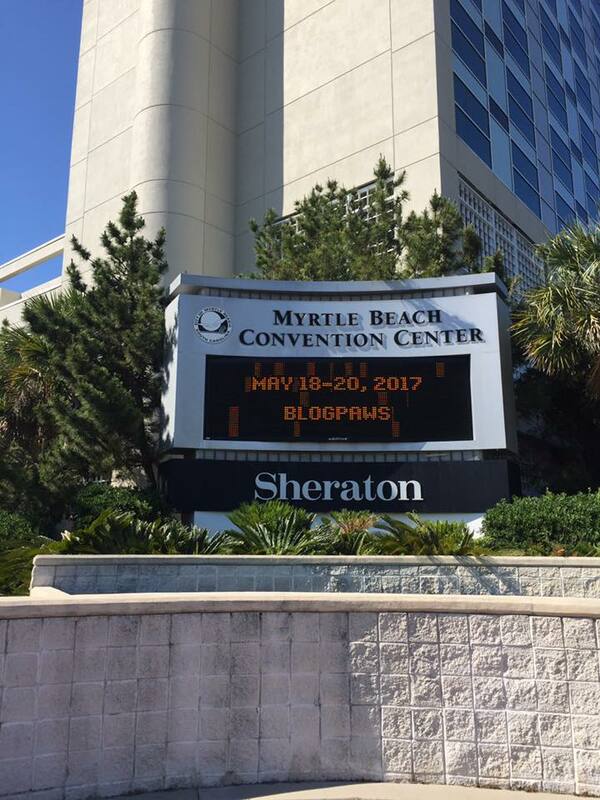 Before reading this, you may want to check my previous preview post about the BlogPaws/CWA conference that took place at the Sheraton Convention center in Myrtle Beach, South Carolina. As a follow-up, I’d like to share five important things I learned from the conference. Multitasking is counter-productive. Although I’ve suspected this for some time, Robbi Hess of All Words Matter in her seminar, “Overworked & Overwhelmed? 4-Step Process to Reinventing Your Writing & Your Routines,” stated that “multitasking is not your friend” and that the only way to get things done effectively is to focus on one task at a time. Hess also outlined a way for conference attendees to organize their goals. You’re Perfect the Way You Are. This was one of the ending remarks of Kathleen Gage’s keynote address, “The Delaney Factor: Discover How to Overcome any Obstacle and Achieve More Than You Dreamed Possible.” Gage emphasized, through personal example and those of other people who have achieved their dreams despite setbacks, that the only person we need to compete with is ourself. We are all unique with unique talents and abilities, and we should not let fear or insecurity stop us from reaching higher goals for ourselves. Content Differs by Medium. Twitter users know that they are restricted to 140 characters and that images are the primary focus of Pinterest and Instagram, but how are similar posts fashioned to reach audiences of various social media sites? Susan C. Willett, CWA member and award-winning blogger of Life with Dogs and Cats, explained with examples how this can be done in her presentation, “Telling Tales: How to Write & Craft Posts that Attract, Engage & Keep Your Audience Coming Back for More.”She also went over some important blogging facts such as keeping posts short, how and where to find ideas for posts, and the average length of a link that sets engagement (it’s longer than you think). Networking in person at conferences and events adds a dimension beyond online networking. Although it isn’t always possible to attend in-person events because of costs or travel issues, the benefits outweigh the problems. 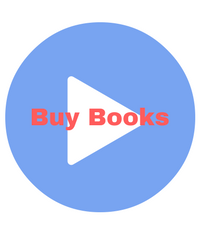 Even if you are restricted to a local author event or book talk, meeting people in person, even those you “know” online, can forge a deeper connection. One of the highlights of my trip was meeting Amy Shojai, CWA founder, CABC, and nationally known bestselling author and pet expert who writes the September Day series of novels, or “Thrillers with Bites,” as she calls them. Amy and I met for the first time years ago at one of the CWA conferences. We have been in touch online, but seeing her in person again after all these years was like reuniting with an old friend. I also enjoyed meeting Mollie Hunt, another CWA member and online friend, for the first time. Like me, Mollie writes a cozy mystery series, The Crazy Cat Lady Series. A new CWA friend, Dawn White, who I met at the conference and had not known online realized that we live very close to one another despite the fact that CWA has members all over the U.S. and several in other countries. 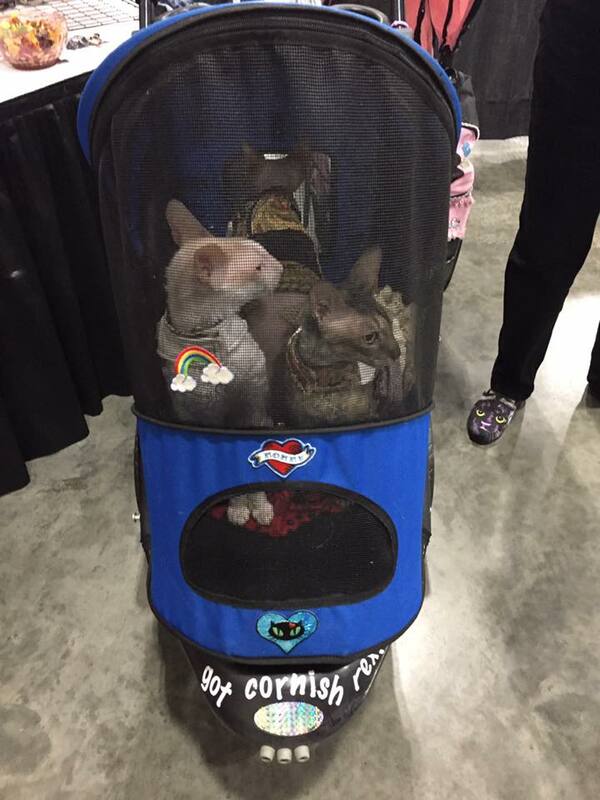 Pet strollers were common sights around the convention center. some anxious and exhausting moments, they can also be enjoyable and fun. 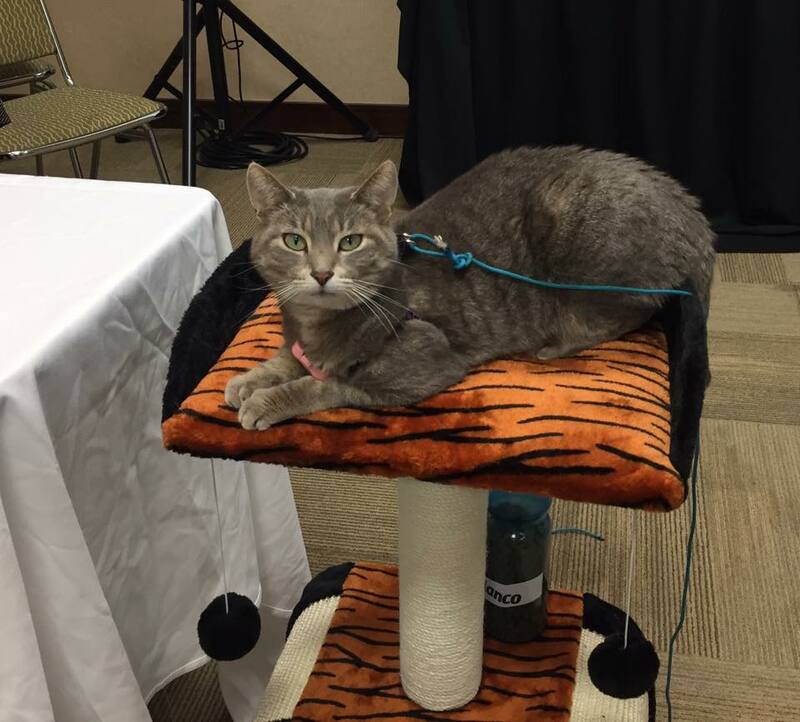 During the joint conference of BlogPaws and the Cat Writer’s Association, cats and dogs were seen throughout the conference center and were guests during sessions and at meals. The exhibit hall was full of booths featuring great products, information, and creative displays, some of them interactive. 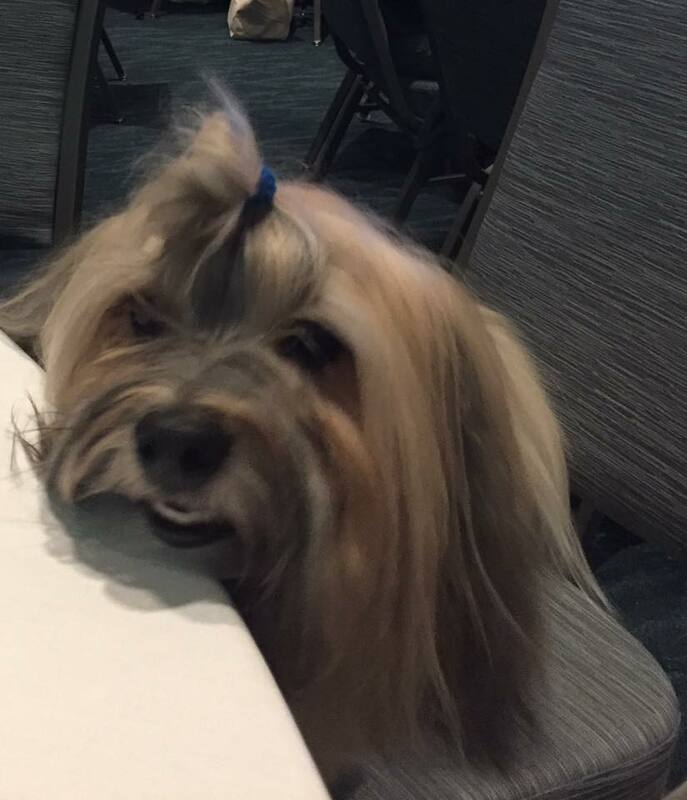 One of the sponsors, Red Roof Inn, a hotel chain where pets stay free, held a Sip and Paint Night where attendees painted a sunset beach scene with pets and, for those who wished, could have their paintings shipped home free of charge. The CWA kitty lounge included a feline/human astrologer, Ellen Zucker of Practical Astrologie. 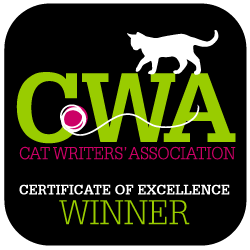 The CWA Happy Meower and awards banquet was a great opportunity for members to chat, grab a bite to eat and drink, and dress up in their fanciest cat clothes. Food was plentiful, and desserts beyond delicious especially one memorable Key Lime Pie. And, of course, the overflowing swag bags by the generous pet exhibit sponsors, made all the pets left at home happy when their person returned from the conference. 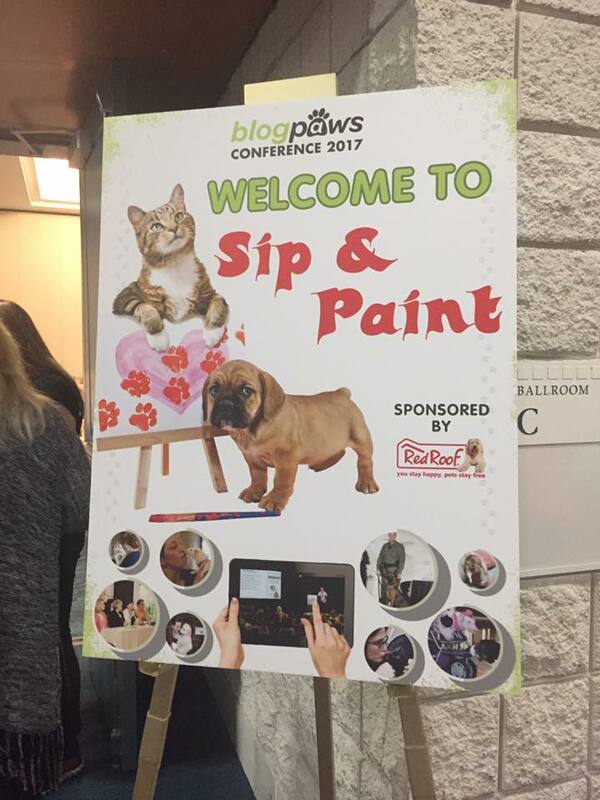 The Sip & Paint event sponsored by Red Roof Inn, a chain of pet-friendly hotels, was a fun event. 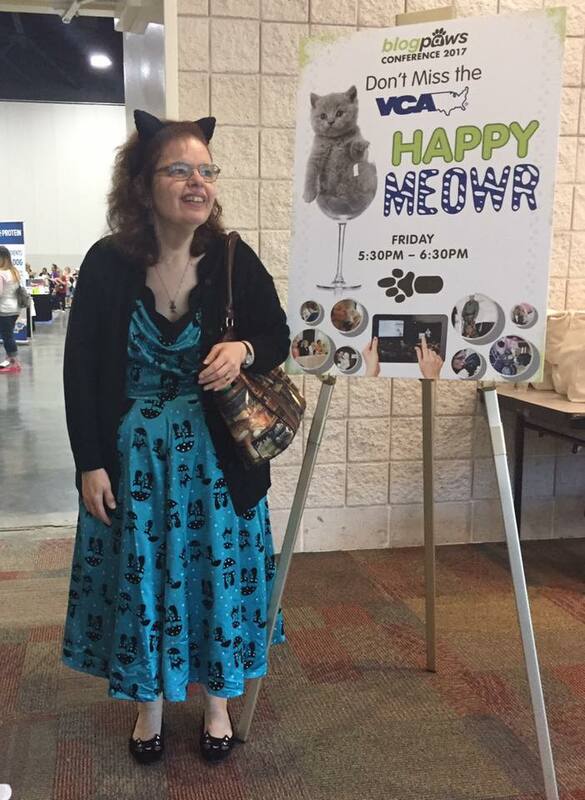 The Happy Meowr and CWA Banquet gave me a chance to strut my kitty clothes. Note the ears and shoes. 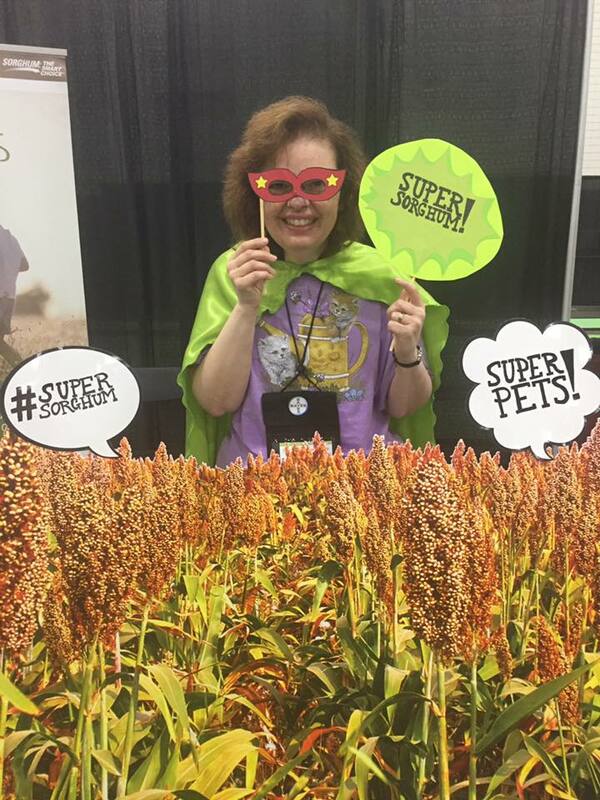 I had many other wonderful experiences at the BlogPaws/CWA 2017 conference. These are only some of the highlights and important concepts I learned. I was able to dress up and have my photo taken at this interactive exhibit booth. 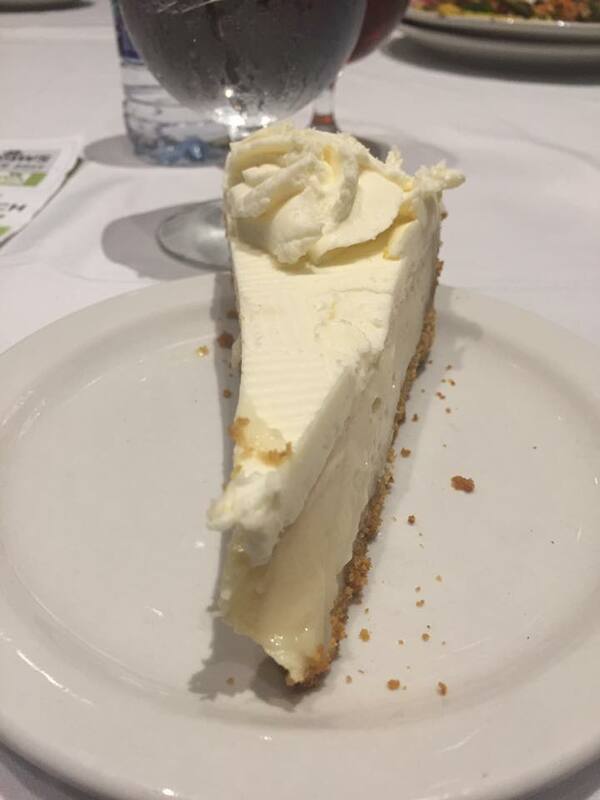 Key Lime Pie was just one of the luscious desserts at the conference that I didn’t care about cheating on my diet for. 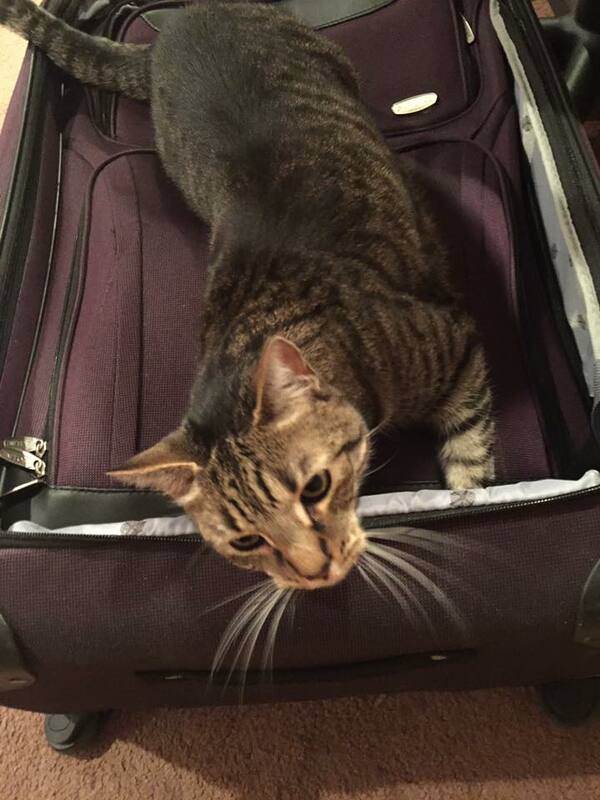 My cat Stripey sniffed the catnip toys in my suitcase when I got home and couldn’t wait for me to open it. Sounds like a wonderful conference. Thanks for letting us share some of it with you. Yesssss, to the multitasking comment! Nice post, Debbie. I have yet to sort all the info from the conference. This sums up some great points. It was a delight to finally meet up with you again face-to-face! What a great time at the conference, so many things to celebrate. My cats (and dog) are totally loving all the “swag” I brought home. And I agree, in purr-son meet ups really add a wonderful boost to relationships. Hope to see you again next year (if not before!). Okay, going to try again to comment. Great seeing you again at the conference, Debbie! I agree, in purr-son is wonderful, and the event was (as always) fantastic. Hope to see you again next year (if not before). Thanks, Amy. Sorry you had issues replying. I think both went through. I am back at work at the library. My cats are in catnip heaven, and I gave away the dog goodies to my dog-owning pals. I hope to attend the next conference. It would be great if it is in New York. Concats again on all your well-earner awards and that incredible “Peeking Tom” mirror! It was great meeting you, Debbie. I can’t believe we live so close to one another. I wanted to take Robbi’s workshop, but it conflicted with something else. I used to think I was the queen of multi-tasking, but I’ve since changed my mind. It’s just frustrating. It’s hard not to multi-task in today’s society, but you really can’t do your best work when you’re divided in so many directions. Nice meeting you, too (although your icon is anonymous, I know who you are). Keep in touch.